Despite its location in the heart of Wisconsin, the Wisconsin Dells is today known as the “Waterpark Capital of the World.” However, it was its rocks—the actual Dells—that first made it a popular Midwest tourist destination back in the 1800s. The Wisconsin Dells—which come from the French word dalles, or narrows—is a 5 mile stretch of gorges and rock formations along the Wisconsin River. The rocks are composed of Cambrian sandstone deposited around 500 million years ago. At that time, present-day Wisconsin lay in the southern tropics, and the Dells were in a nearshore environment by shallow tropical seas that waxed and waned over the area. 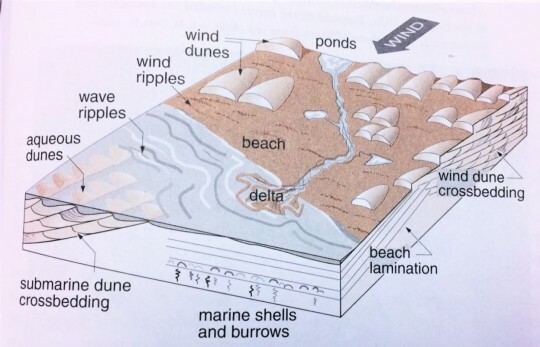 The sandstones were first deposited as wind-blown dunes. (The cross-bedding you can see in the rocks records the orientations that the winds were blowing.) Toward the end of the Cambrian, shallow seas began encroaching the region and deposited marine sandstones over the aeolian (wind-formed) deposits. However, it was a very long time in between when these rocks were deposited and when they became the Dells that we recognize today. During the last Ice Age around 19,000 years ago (when Wisconsin was in its present-day location), the Green Bay lobe of the Laurentide ice sheet ponded meltwater and dammed the Wisconsin River to form Glacial Lake Wisconsin. At its greatest extent, this lake covered much of central Wisconsin and was the size of modern-day Great Salt Lake. When the glaciers began to retreat 14,000 years ago, an ice dam holding back lake waters catastrophically failed, and Glacial Lake Wisconsin fully drained within the span of about a week. This rush of water surged through the Dells area and deeply incised the poorly-cemented Cambrian sandstones to create a series of gorges—the Wisconsin Dells that we see today. It’s quite a strange twist of fate that an area so rapidly formed by raging waters is now home to guests who play in them all day! Next postCould a Sinkhole Swallow Walt Disney World?